you’re probably familiar with the postal credo of not letting rain or snow or sleet interfere with duties. in the south pacific ocean nation of vanuatu, that guarantee extends to being totally submerged underwater. 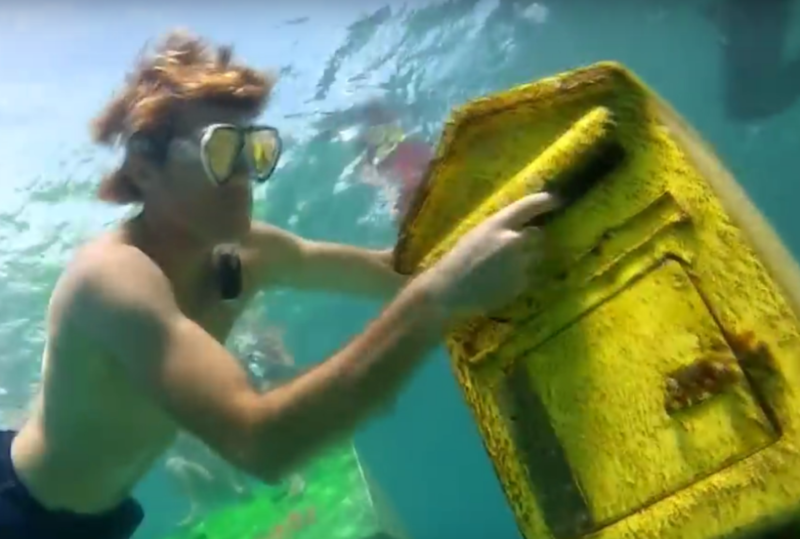 welcome to the world’s only underwater post office. island postal officials debuted a deep-sea post office adjunct in 2003. tourists to the collection of more than 80 islands can dive roughly 10 feet (about 3 meters) down near hideaway island to discover a staffed aquatic postal station. vanuatu clerks can even postmark the correspondence, substituting ink for an embossing device that proves it’s in transit. the cards can then be sent internationally. if the idea of conducting mail transactions while snorkeling isn’t extreme enough for you, vanuatu also offers a drop-off box situated on an active volcano on mt. yasur. Sometimes my mail looks like it was dragged underwater…LOL Great post, so much fun. Oh how I appreciate adventurous and creative people! Dude. I had no idea. Wow indeed! Wow, this is crazy! I have to see this one day! A strange but uniquely chosen location for mail. Hope this post of yours goes around the world and back; but no one goes postal about soggy mail. It has got to occasionally happen!